A beautiful and classic piece of art nouveau furniture. This large and highly decorative mirror back sideboard features a typical art nouveau styling with hearts and tulips. It also features a large shaped bevel edged mirror and numerous cupboards and drawers giving a vast amount of storage. The item breaks down into three individual pieces, and if too tall, the decorated piece to top could easily be removed to suit your requirements. The item is in fair condition for its age, but unfortunately, we do not possess the key. Please be aware that there is a small amount of foxing to the corners of the mirror which is clearly shown in the photographs. 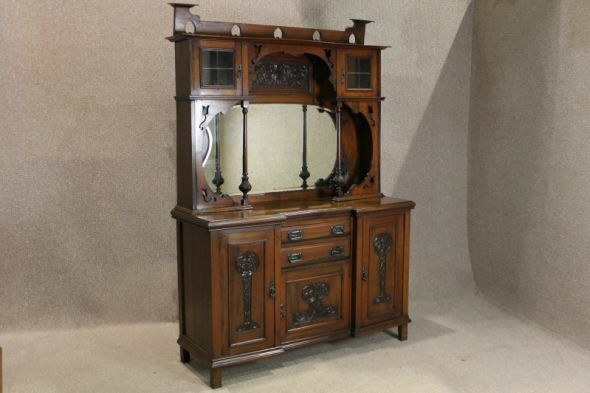 This art nouveau sideboard is still an extremely decorative piece of furniture.